The Camlachie Burn was beginning to get a few posts on the Molendinar topic so rather than continue dragging it off topic, I thought I'd start a new one. 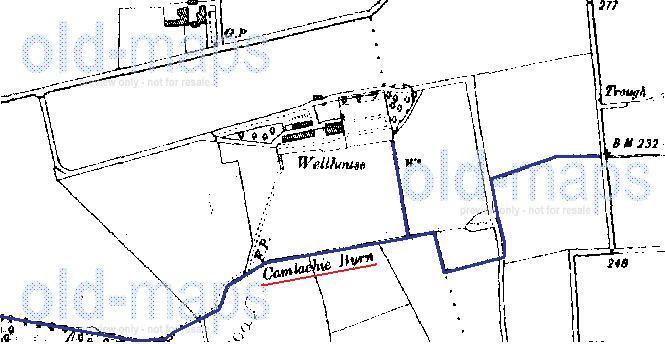 Scottish Water plans showing the line of the Camlachie Burn had been posted (by Toomse), however the plans don't show the full length of the burn - they only show it up to where it crosses Edinburgh Road at Barlanark/Wellhouse. I commented that I knew it extended beyond that point. I thought I'd help illustrate this with the aid of a plan extract from the OS Old Maps website. Below is an extract of the OS 1934 plan (I chose this one as this is the earliest one showing Edinburgh Road, which is our reference feature) for the area of interest. You can just about make out the line of the Camlachie Burn to the north of Edinburgh Road, with the words 'Camlachie Burn' and a directional flow arrow being barely legible. 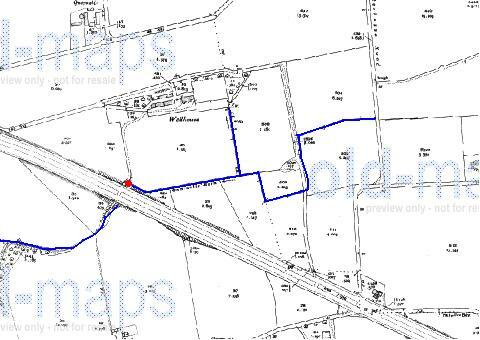 Below is the same plan with added annotation to show the line of the burn and the uppermost point (indicated by the red dot) to which Scottish Water's plans show the Camlachie Burn. The furthest upstream section (the bit running east to west with a slight bend in it) in the above plan is the section in (what is now part of) the grounds of Easthall Primary School that I referred to in my previous post mentioned above, as quoted below. Glesga_Steve wrote: The culvert runs along the southern boundary of Langbar Crescent (on the grass verge side of the fence), follows it round parallel to Wellhouse Road and then crosses the road into Easthall Primary School. If you take a trip out there you'll notice there are large heavy duty rectangular manhole covers along this route that are not shown on our GIS - they are on the culvert. I know this because I traced the line for work purposes many years ago (before we had GIS and everything was recorded on paper plans). If you zoom into the school, you'll notice a small surface water sewer is shown running along the embankment to the south of the football pitch - this is in fact, the top of the Camlachie Burn culvert. Below are extracts of the OS 1946 plan showing a close up of the part of the burn north of Edinburgh Road. The burn still flows through this area in culverted form, though the route was changed when the Wellhouse area was developed. It doesn’t seem to have a natural source any longer as the dry weather flow in the upper section is practically non-existent (from memory it’s barely a trickle – this is probably just groundwater infiltration through the pipe). It’s ‘source’ in this area now is the highway drainage discharges in wet weather. Our archive at work has a copy of the drainage layout for the area (it's drained on a partially separate system - the foul waste and roof run-off drains to the public sewerage system; the road drains to a highway drain, which is not shown on Scottish Water's plans, and this then drains to the Camlachie Burn) when it was first developed - I'll fish it out next time I'm there as I'm pretty sure it shows the realigned route of the burn in its culverted form. I wonder if the "well" in the word Wellhouse was connected to the source of the burn. 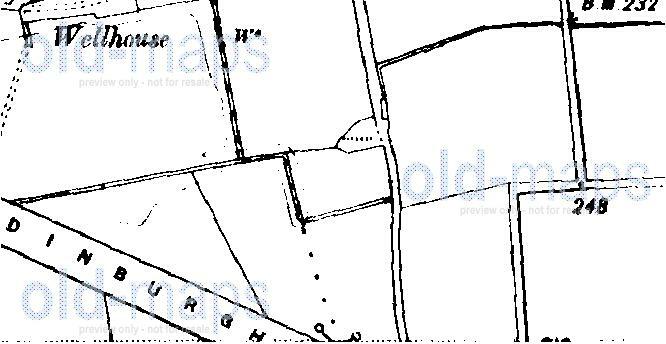 As the name of the buildings suggests, and you have alluded to, there was a well in this area - it was called "St. Mark's Well", as shown in the below extract of the OS 1864 plan. 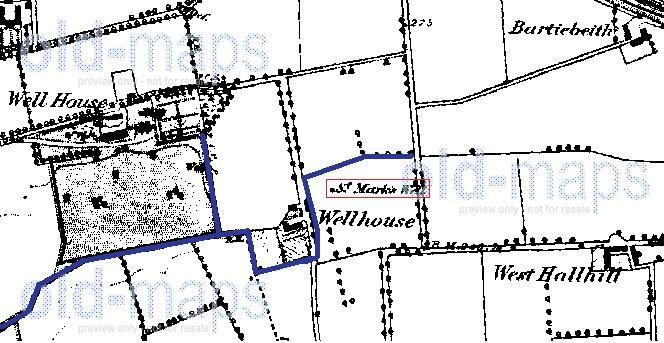 The well isn't indicted in plans dated after the above one, though one of the buildings with the Wellhouse name was still shown on the OS 1914 plan. The well is referred to in an interesting 1930 document called "A Sketch of Shettleston" by a Dan McAleer. About sixty four years ago a man named James Hayes and his family left Crownhall, Eastmuir to live at Crosspars. The families that lived there were very much handicapped due to the lack of good drinking water, and James Hayes sunk a well about 100 yards from the houses on the Wellhouse estate. It was spring water and was very cold even in the summer months and clear to the bottom and the men and women, boys and girls walked from Eastmuir very frequently in the summer to get a drink of water from Jamie Hayes’ well. I passed through the estate about a year ago but no trace of the well was to be found. Only I knew the spot I frequently visited when a boy. The last time I inspected any part of the burn culvert in this area was on the evening of 30th July 2002 when the below happened. The kids in the floodwater were standing at Point A in the below image (the arrow shows the position/direction the photo was taken from). They were holding on to the fence for safety as they tried to make their way towards the photographer to get out of the floodwater. The Fire Brigade were there at this point, however they were too busy, rescuing/evacuating the residents from the flats around the square (Delny Place / Dunan Place), to be able help the kids. As this photo was being taken, I was wading around in the vicinity of the shallower floodwater at Point B, trying to lift the covers off the trunk sewer manholes to allow the water to get into the sewer and thereby relieve the flooding. That was a long night I can tell you - large parts of the east end (and beyond) were severely flooded. Flooding started to occur around 1pm - I didn't get home until 5am the following morning and many areas were still severely flooded even then. Investigations undertaken in the following weeks revealed that the burn culvert was badly blocked (with roots, debris, etc) a short distance to the south of Edinburgh Road. In the present day it first surfaces at the SW corner of Barlanark Park. This wee burn was the cause of the massive flooding in the Springboig/lower Carntyne area in the 90's. Icecube wrote: In the present day it first surfaces at the SW corner of Barlanark Park. This wee burn was the cause of the massive flooding in the Springboig/lower Carntyne area in the 90's. I remember those incidents (Fair Friday 95 if I remember right) too. It wasn't just the Camlachie that caused it, there were many other factors involved, including significant flooding from the sewerage system. 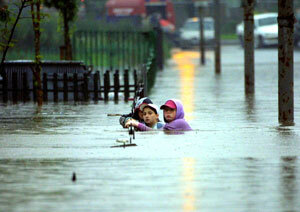 Incidentally, the Springboig/Greenfield/lower Carntyne areas also flooded on the 30th July 2002. The ground floor flats in Cockenzie Street (Greenfield) were flooded almost to ceiling level - you can still see the water mark on the buildings to this day. Thanks for the additional info, guys. i recall billy connolly doing a fundraising gig to support the families of the east end flooding.